personal Comments Off on You can stop worrying now. The chaos has moved away from the palace. Only the various guards and couriers and other officials remain. A servant enters the room and stands silent waiting for a command. The servant walks out the large double doors onto the balcony and picks up the heavy basin of water and the towel draped over it. The water sloshes as he walks out, some spilling on the mosaic floor. Pilate stares at the spilled water and at the servant who doesnâ€™t stop walking. Another time he would have the servant whipped. Not today. He is exhausted by his position today, though the servant may make up for this later. He stares out over the courtyard where not long before crowds and rebellion had been calling for blood. Pilate gave it to them. What else could he do? Soft footsteps and rustling of fine robes stir his frustration again. â€œIt is done,â€ Pilate replies. In my rambling netflix adventures I delved into a movie from the past, getting it almost for the sole reason that I remembered liking it a lot when it came out, even saw it a few times, but not remembering at all why. Sometimes I get television shows, sometimes recently released blockbusters, sometimes art movies, or obscure movies, or movies that somehow I missed. This time around I watched the Fisher King again. It’s a good movie, to be sure. All the usual lofty movie language can be used describing the acting and directing and cinematography. But, there’s something under the surface for me, and I can’t quite put my finger on it. I am convinced there are events and influences in life that if they happen to strike you at just the right time can be enormously powerful, yet exceedingly subtle, forces of change. Neurons go on different paths. Different choices are made. Thoughts lie beneath the conscious self tickling just enough without revealing themselves beyond a mere nagging instinct that makes one say, “no” to certain explicable things, and “yes” to the inexplicable. For whatever reason this thought popped into my head tonight while watching this movie. Only I’ve never thought of this movie since seeing it last. So, I don’t know if it is one of those influences or if it only has the texture of one. All throughout there was that inner tickling, as though there were thoughts it was provoking which don’t quite see the light of day but operate deep beneath. It’s interesting. I don’t know why. Do I identify with these particularly different characters in some way? I also know that near the end my right eye got watery and my left eye let a few tears go. Not many movies do that. I was seventeen or thereabouts when I last saw this movie. I don’t remember any tears then. Maybe the themes from this, and similar themes from other sources, took a long time sinking in. The purest tears are those which have been long distilled, especially when it comes to movies. Interesting. I’ve intrigued myself, and that’s a fine basis for another go at self-analysis. What’s going on there under the surface? And who is that red knight on the flaming horse that I saw earlier today? Maybe when I get to 1 John tomorrow I’ll find a little more answers. I suspect I will, even if it’s still a wisdom I’m learning how to grasp. Once again, I realize how so important it is to read through the New Testament as a whole. That’s something drilled into me, along with a love for primary sources, in college. Don’t read snippets, or chapters, or key verses. Read the whole thing. A person may be able to walk down the evangelistic Roman Road without having any idea what it was Paul was about in the Book of Romans. The jumping around means missing all sorts of important details, details that seem to generally be prefaced by the all important “therefore.” We like the initial thoughts, the points about Christ’s work and salvation, his coming, his going, his coming again. We tend to ignore the various therefores. Or, rather we replace them. “We are saved by grace,” we say, “so therefore…” and we go on to make up our own therefore depending on our tradition. Some therefores have little more than evangelism, which as far as I can tell makes up exactly one therefore in the entire New Testament (albeit a very important one). Other therefores include putting together complex liturgical responses, even as many of the actual therefores are prefaced by saying such are not at all important. Like all the world we take a little of the God we are told about and then decorate him up in our own images. We insist God wants what we feel he should want, and we justify it all with excitement and indignation and dismissal of those who disagree. It’s a worthwhile study, therefore, to study the therefores. I highly recommend it. From what I can tell, the great majority of therefores entail the idea we really shouldn’t sin anymore. We’ve been saved by grace, sure thing, so now what? Act like it. We haven’t been saved so that we can bounce around in glee and distraction. We’ve been saved so that finally we can get to work. And it is in our responding to the various therefores that we become the sorts of people who naturally resonate the Holy Spirit, and through our lives preach the Gospel, with our words following with true wisdom. Unfortunately by replacing the therefores with our own therefores we create a false work, a work for God but not of God, even when this work seems so utterly devoted to God. God wants us to do what he wants us to do because he’s very good at his own work. We think we’re smart, only we’re not. We’re bumblers. We have no idea what’s going on in the wider world of physical and spiritual. Which again means it’s important to read the plan God has developed and taught. He tells us the what, and he tells us the why, and he tells us the what then. We like the what so much we ignore the rest, and then folks ignore us because our what never has quite the bite of God’s what. So deep are we in it, however, that we take this rejection as a rejection of God himself. We think we are reflecting him, and so any rejection of our efforts is a dismissal of God, when in fact God often dismisses us for much the same activities. Knowledge isn’t wisdom. God wants us to seek wisdom, not merely knowledge, and this requires following all those various therefores. Otherwise we get confused, and others get confused, and the whole party becomes a wreck. Christians will suffer for preaching the Gospel. But, to have merit we have to make absolutely sure we are indeed suffering for the message of Christ, and not our own particular versions of what Christ would have us do. All too often we suffer for doing for God that which God hasn’t asked us to do, and the suffering is on our own heads, and the heads of our children. Being a meddler. If we suffer for meddling we should be ashamed not proud. After the prayer there was activity in the brain, but God was not in the brain. Uncategorized Comments Off on After the prayer there was activity in the brain, but God was not in the brain. Turns out there’s no particular God spot in the human brain. Though, mystical experiences do seem to activate the Love areas. Sort of like John said then, I suppose. 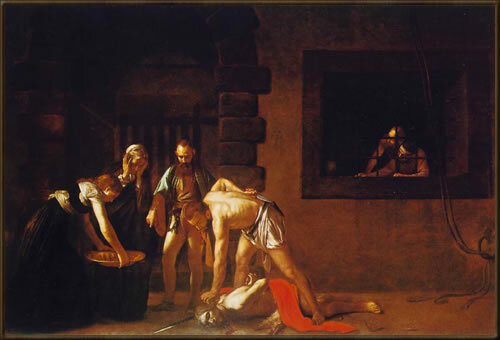 Upon looking to my right at my church calendar I notice today is the commemoration of the beheading of John the Baptist. This is a rather shocking event really. Wasn’t John, next to Jesus, the most important person in the New Testament, filled with the Spirit, called by God before his birth, the first to recognize Jesus while both were still in the womb? Where was God’s defense? Where was the blessings of one who preaches Truth? Where was the honor and privilege and joy? Though commended for his faith did not receive what was promised, since God had provided something better so that he would not, apart from us, be made perfect. He saw the beginnings of that which he prophesied, a gift not given to other prophets. Even still he doubted and was confused. Yet he had faith. He asked and was answered and so died in perfect belief, not realizing it all would become even less clear before the truth of his message would truly find fulfilment. He played his part. He spoke according to the Spirit. He was the forerunner and is honored accordingly, not because he received great blessings, but because he was a blessing to God the Father and the Son and the Holy Spirit. This isn’t the end one would except from such a one as John the B. Of course, the key bit is the fact this isn’t his end. Sure, he was beheaded and all. But, it’s what comes after even that which proves the measure of Christ’s gift to John, and to us all. It was said by some wise old monk in some source I can’t remember there are two types of spiritual seekers. One begins with discipline and through this attains contemplation. The second begins with contemplation and then discovers the bounty of discipline. Most “religious” folks so called are, in my opinion, likely the former. They hold the practices themselves in the highest regard. Those who are “spiritual” are mostly the latter. They believe in spirituality but too often disregard the established patterns which can deepen one’s insights. Oddly enough I’m very much the latter myself. Christianity, to me, is a dance with the Spirit of the Living God, an individual and communal relationship which more often than not is sharpened better in the beauty of a forest than in a concrete carpeted church. However, my being this way isn’t enough. The truly mature have both discipline and contemplation. So I regularly have to find ways to make up for my inherent secondary interests, rising and falling in my ordered spirituality which oddly enough seems to have no direct relationship with the rising and falling of my contemplative spirituality. Sometimes I am urged towards discipline because of a waning inner life, sometimes because of a waxing (the moon kind, not the hair removal kind — I have no experience testing how that kind might affect my spiritual life). Likely it has something now to do with all the reading on sin I have been doing, and thus the readings about how to fight it. I got to looking for a good devotional and found one that, for me, hits the spot. It sets up for 3-4 times of daily liturgy and reading, and includes two smaller readings as well. Plus, there are special prayers and liturgies for special events or places. It’s nondenominational so I don’t run into the sorts of theological barriers that sometimes hit me when I use similar such prayer books. Plus, it’s Celtic themed. I bought the Celtic Daily Prayer book, but it has also been partly put online by those who wrote the book. With this I also got a copy of the Carmina Gadelica, which is a (one might say the) collection of ancient Celtic prayers and hymns. It used to be six volumes in both Gaelic and English. Now they’ve put a version out with just the English translations in one volume. Fine inspiration this. May the Three watch me by day and by night. Each step of the stormy world. I’m now on the Pastorals, and thus far in chapter 2 NASCAR hasn’t made an appearance. All well and good, though I do have a good point coming from other books involving qualifying and racing and well, now you’re likely figuring out what’s happening in my mind. But, here in the Pastorals another old bother (I say this in the nicest way) came to roost. My tradition is rather non-Catholic. My alma-mater fired a fellow for becoming a Catholic. And yet, if I could choose just about any church to visit in the greater Los Angeles region for an occasional Sunday it would likely be the Cathedral, plus I count among my closest friends quite a few people for whom the RCC was and remains quite formational. Plus, there’s the tricky bit about my own obsession with monastic writers, and claiming Orthodoxy for some of them doesn’t quite get me out of the ecclesial bind. Which is where my own version of anti-Catholicism comes in. I don’t have a problem with it. My problem solely comes from the fact they have a problem with me. I’m happy to take communion with them, and would gleefully leave the mystery a mystery, only they insist I make the mystery into a Grecian interpretation of a Jewish rite. I honor their prohibitions, and so don’t bother, though am bothered they’re bothered. Plus, there’s the problem with the fact I don’t see succession as ever being within the workings of God, except with the particular line he has chosen, which is David’s line, not Peter’s. And David’s line itself had quite a gap until just the right guy came along to fulfil it. Not anyone afte a couple of generations past David along the way had any authority. God always has knocked succession on its various behinds whenever corruption abounds. So, I just don’t think there’s a way a fellow in Rome can speak for the Living Faith in the way the Spirit who teaches all things to all those who believe would settle for. That’s just me. I’m particularly Protestant. Like I was saying, I’m in the Pastorals, and got that old bother of WIANC (why I am not a Catholic). I’m sure smarter people than me have explained this away somehow, or limited to the context/culture in the way they would be aghast at other verses being so used (see any relating to women). But, it remains a question for me, so I’m asking it here, because… well, I’m asking it here. In 1 Timothy 1:3 Paul tells Timothy to command certain men not to teach false doctrines any longer nor to devote themselves to myths and endless genealogies. These promote controversies, he says, rather than God’s work, which oddly enough is by faith. Love is the goal, you see, not the other stuff. Here’s the question, which I don’t have an answer for or really an opinion, that latter lack a lot more unusual than the former. Apostolic succession is built on a list of authority tracing back to Peter who was, the high church folks say, the founder of the Family, the first to be elevated. They then trace their lineage back to him, through the various bishops of Rome, until we get back to Benedict the present Pope, whose authority, and palace, and nice outfits, and bulletproof cars relies on the lines of Apostolic succession. Isn’t this a genealogy? Who cares who the fellow was a few lives back, Paul seems to say, what have you done with and for God. Which brings the issue back to the present, and to the Spirit, and to the curious freedom we have in Christian community. Though, clearly later in the letter there are rules about elders, so it’s not an authoritative free for all, only those elders, it seems, better have lives of their own which are right in order to keep the authority. So, that’s my thought for the evening. Back to reading about the goodness of a properly used law. So, I’m reading through the New Testament this past week, trying to get my hands around its teaching and approach on a particular subject. This, by the by, again proves that reading the New Testament generally makes for different theology than hearing someone else’s condensed version. It wasn’t that I saw something new, because I went into my present project having already strong impressions from previous readings, but it is interesting how what can so thoroughly be present is so thoroughly considered absent. It’s amazing how much time we spend doing those things the New Testament just about specifically says don’t worry about overmuch while virtually ignoring in action those things that the New Testament goes on and on about. We certainly view through the glass darkly in our present, but I think a good half of that dark is our own smudges. Some spiritual windex would do the Church mighty well. All this is a topic for another day, and one which in itself is so obvious and so repeated it hardly counts as a new observation. My concern right now is me. Through the last few days I have been reading through Paul’s letters and I gut stuck on an analogy. I keep thinking about NASCAR. This isn’t odd to the great many people in this country who adore the racing round, but I haven’t ever been the sort to appreciate asphalt, loud engines, or grease. Motorsports have utterly no place in my list of loves. But, I keep thinking about NASCAR when I read Paul. In fact, last evening I was actually excited that after a day of reading through various epistles I turned the television on just in time to start watching the Sharpie 500 at the Bristol Motor Speedway. Now, maybe it’s because I’ve never actually watched a single NASCAR race before this, let alone the bulk of one as I did last night, but really, even if they throw down a lot of cash to sponsor a race someone should have stepped in and said, “No, we’re not going to call it the Sharpie 500.” That makes it sound rather, well you know how it sounds. I’m not sure what happened yesterday, or what it betokens. Am I going to pick my favorite driver now and buy an RV and travel around the byways to the various speedways and raceways? Am I going to prefer asphalt and concrete to dirt and forest? I don’t know. I do know that I’m going to have to get up to speed on how the whole point system works, worrying about my self all the while. Maybe it’s a good sign, and a sign I haven’t fully turned my life over to a new gospel, that I only watched to about lap 300 (out of 500), so I don’t know who won. Did I fight the temptation or did I falter in perseverance? Though, it’s likely also another sign that I didn’t even think of the fact I didn’t watch to the end until right now, the distractions pulled me away and thoroughly so. It’s another sign altogether that I’m now interested in who won, and will spend a moment checking. It was Matt Kenseth, who also apparently won last year. I refuse to check how many points he won, or what the overall championship standings are. I still retain some balance. I have in fact liked country music for a season or two in my life, so maybe there is a curious part of my soul that NASCAR could fit into without too much change. I don’t know what I think about that even still. Prayers are appreciated on my behalf. I had my summer vacation I guess. Went to an island a couple of weeks ago, then spent the last few days hanging out with old friends in old neighborhoods, not near my computer. But, with that out of the way, I’m getting back into the flow of things and I have few plans to wander any more. Which means once I get settled it’s back to learning everything again.